Are you new to telegram? Telegram is easy steps to join Cosplay Token telegram! Cosplay Token Project is aiming sustainable development of cosplay economy. To achieve this, Cure WorldCosplay will issue “Cosplay Token (COT) ”, which is to become de-facto currency of cosplay economy. Visit official site to learn more! Download Telegram app if you have not. 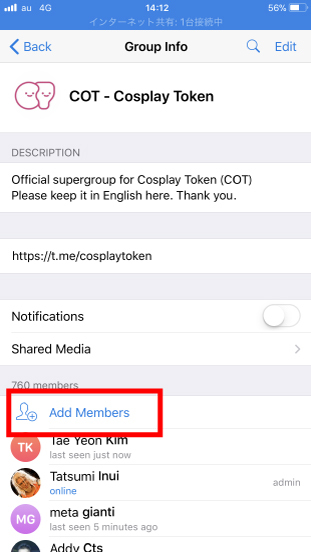 Once you did, please tap the URL below and it will open Cosplay Token group on telegram app. Tap +JOIN to join Cosplay Token group. You are now ready to start conversation on telegram. Enjoy cosplay related conversation inside the group 😀 !